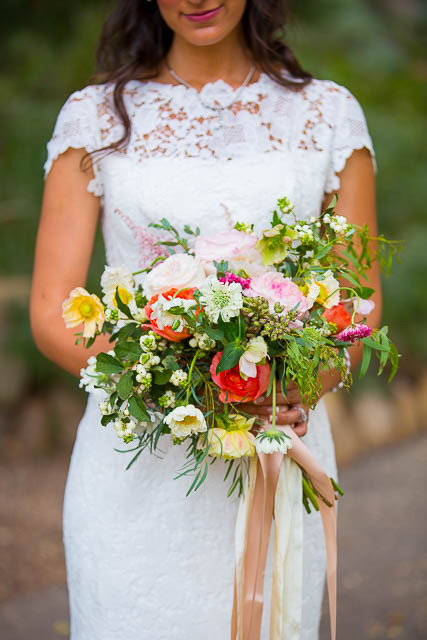 Looking for inspiration for your wedding bouquet? 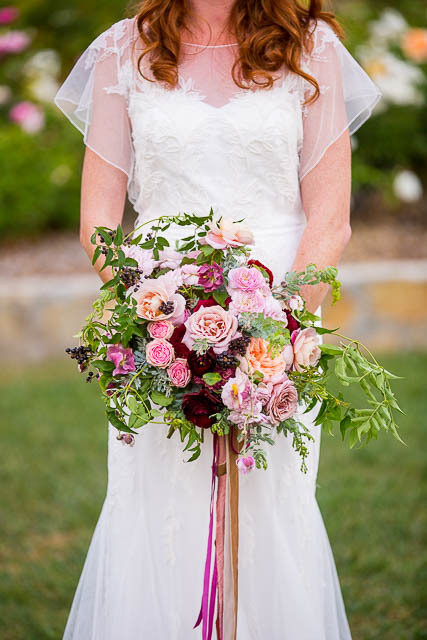 Large, flowy, colorful and wild Victorian-esque bouquets with long ribbons are currently trending, like these bouquets. They’re fun, add elements of wilderness and creativity, are unique, and, of course, photograph well! 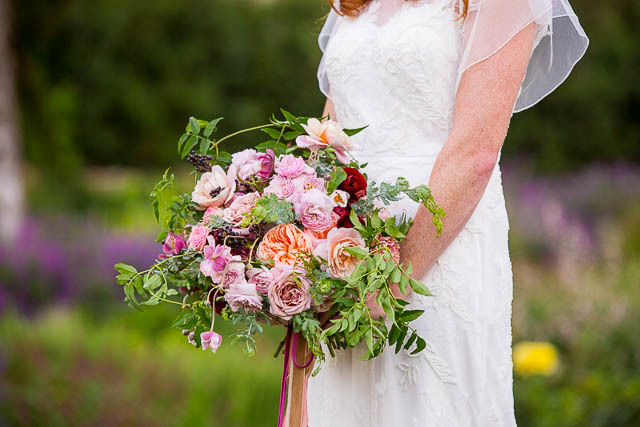 “Since Evelyn, the bride, is a gardener and passionate about specific flowers and plants, I was on a quest to find a few of her favorite varieties: the dusky brown-mauve ‘koko loco’ and ‘distant drum’ garden roses, as well as a beautiful spray garden rose called ‘florence de lattre,’ all from a local farm. She had just planted some ‘koko locos’ in her own garden. These subtly-hued neutrals, especially ‘brown’ and caramel colored flowers, are all the rage right now for the less traditional bride who wants an unusual take on muted tones. Needless to say there aren’t many flowers that fall in this range and sourcing them is part of the fun for floral designers. And because she appreciates so many different types of flowers, I included Japanese anemones, traditional anemones, hellebores, antique carnations (another ‘brown’ shade) and several types of foliage for loose lines. Jasmine is a popular, delicate vine and special to Evelyn because it grows all over her neighborhood. We tied the bouquet with long raw silk and velvet ribbons because they felt appropriate for fall and reflected her rich color palette. Happy planning! Have any questions or comments? Let me know either by commenting below or shooting me an e-mail at info@karendphoto.com.